A recent addition to the series, ''Milestones of Catholic Thought'' (I Believe in the Holy Spirit by Yves Congar is another), and a milestone this is, having significant influence on Vatican II and on John Paul II. Here is found de Lubac's reflections on the marrow of Christian living -- the relationship between nature and grace, the journey of the person toward supernatural depth and being, perfection in Christ. Fully engaged with the Fathers and Thomas, and many other important scholastics, de Lubac becomes increasingly convinced that grace and supernatural reality is not to be understood as something ''super-added'' to natural life, but rather that which lies within the heart of nature. That is, God in creation has placed a supernatural ''existent'' within nature that responds to and desires the natural fulfillment of supernatural ends. 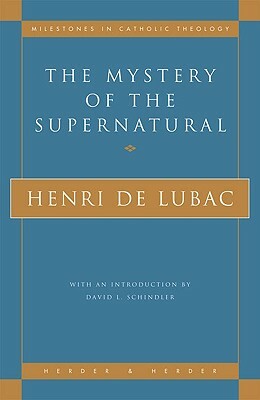 Believing that the Fathers clearly teach that nature is indeed made for the supernatural and that ''God is more interior to me than I am to myself,'' de Lubac instructs us beyond modern rational apologetics to true apologetics, unpacking the double burden of our existence -- the gratuity of grace distinct from and unanticipated by human nature, and the condition of human nature as already called to divine vocation in Jesus Christ, and therefore embedded from the outset in a supernatural order.